A ship that left New London, Conn., last Thursday en route to St. Petersburg, Fla., got caught in a dangerous Hurricane Sandy while 90 miles off Cape Hatteras. NBC's Lester Holt reports. Updated at 11:43 p.m. ET: Searchers on Monday evening found the body of one of two missing crew members of the stricken ship HMS Bounty, which sank off the coast of North Carolina after it was caught in Hurricane Sandy, the U.S. Coast Guard said. Claudene Christian, 42, was pulled from the water unresponsive and transported to Elizabeth City Hospital, the Coast Guard said. She was later pronounced dead. Crews continue searching for the remaining missing person, identified as the ill-fated ship's captain, Robin Walbridge, 63. Earlier Monday, two Coast Guard helicopters rescued 14 people from life rafts after they were forced to abandon ship. Coast Guard rescue pilot Lt. Jenny Fields told NBC News that the rescue operation was a "challenging hoist" but that she was lucky to have a "skillful crew" on her Jayhawk helicopter. Fields said those rescued appeared in "good spirits" and were "happy to be able to relax." Hurricane Sandy sunk a tall ship off the coast of Hatteras, N.C. The Coast Guard was able to rescue 14 people but two remain missing. Watch raw video of the rescue. "It's one of the biggest seas I've ever been in. It was huge out there," Haba told The Associated Press. The two crew members who went missing were wearing survival suits designed to help keep them afloat and protected from cold waters for up to 15 hours. The 180-foot, three-mast ship issued a distress signal late Sunday after taking on water, the U.S. Coast Guard said in a release. The director of the HMS Bounty Organization, Tracie Simonin, said the ship -- which was built for the 1962 Marlon Brando movie, "Mutiny on the Bounty" -- had left Connecticut last week en route for St. Petersburg, Fla.
"They were staying in constant contact with the National Hurricane Center," she said. "They were trying to make it around the storm." After receiving the distress signal, the Coast Guard sent out an aircraft to speak with the crew, which reported that the vessel was taking on water and had no propulsion. The rescue took place in winds of 40 mph and 18-foot seas about 90 miles southeast of Cape Hatteras, N.C. 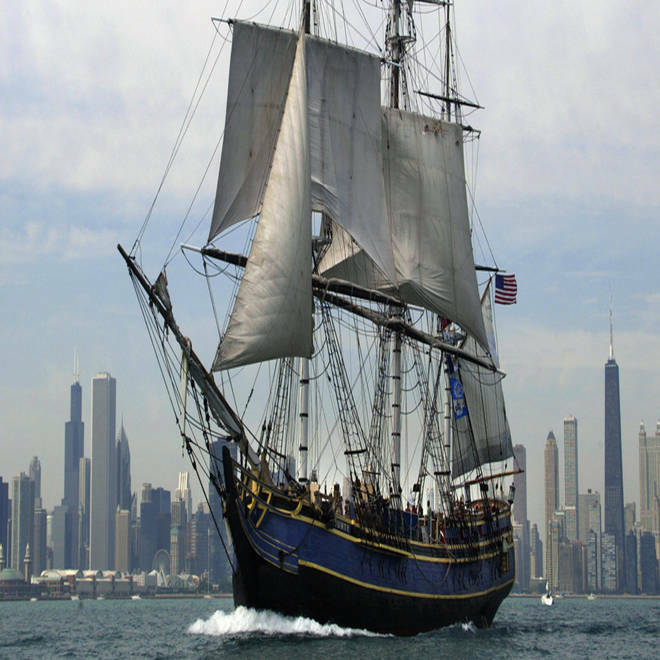 The HMS Bounty, a replica used in the Marlon Brando movie "Mutiny on the Bounty," sails past the Chicago skyline in this image from July 2003. Those rescued were taken to Elizabeth City, N.C. None had life-threatening injuries. The Coast Guard identified them as: Daniel Cleveland, 25; John Svendsen, 41; Matthew Sanders, 37; Adam Prokosh, 27; Douglas Faunt, 66; John Jones, 29; Drew Salapatek, 29; Joshua Scornavacchi, 25; Anna Sprague, 20; Mark Warner, 33; Christopher Barksdale, 56; Laura Groves, 28; Jessica Hewitt, 25; and Jessica Black, 34. The vessel reportedly sank, but the mast was still visible, the Coast Guard said. Mary Ellen Sprague said she talked to her daughter, Anna Sprague, after the rescue. She said her daughter had been aboard the HMS Bounty since May. The ship was going to spend the winter in Galveston, Texas. "She was probably the youngest member of the crew," Mary Ellen Sprague told the AP. She said she had not learned many details yet because her daughter, normally talkative and outgoing, was being uncharacteristically quiet. The Bounty makes frequent trips around the country, offering a glimpse into maritime history, according to the ship's website, which appeared to be down Monday. It was originally a British transport vessel, and the replica has appeared in several films, including the 2006 movie "Pirates of the Caribbean: Dead Man's Chest," with Johnny Depp. Its last stop before its winter hiatus in Galveston, Texas, was to be in St. Petersburg, Fla., on Nov. 10. It is unclear why the boat set out to sea with Sandy bearing down. Sandy could be the largest storm ever to hit the United States, according to NOAA's website. The Associated Press and NBC News' Rachel Elbaum and Jim Miklaszewski contributed to this report.